PARAGUAY: Forced from their ancestral forests by the arrival of big agriculture in eastern Paraguay, the Ache people gave up the hunter-gatherer lifestyle that had sustained them for centuries. Now they have taken up farming themselves – and they want their old land back. The Ache’s homeland was remade in the 1970s by the mass arrival of industrial farmers from neighbouring Brazil. A territory of fertile land and abundant rivers, the tropical region provided the lush backdrop for the 1986 Academy Award-winning film “The Mission”. Drawn by these natural riches, the Brazilian settlers set up huge farms, clearing forests to make way for agriculture. The changes were devastating for the Ache, who had managed to preserve their way of life despite centuries of clashes with white colonisers from Spain and Portugal. The animals they once hunted for food became scarce as their habitat was destroyed. That ultimately forced the Ache, who risked dying out completely, to abandon the forest. They were among the last indigenous people in Paraguay to give up hunting and gathering and adopt a sedentary lifestyle. Now, what they lack is land – once abundant and free, suddenly scarce and expensive. Lorenzo Puapirangy, 38, chief of the Ache village of Puerto Barra, says its inhabitants between them have “just 270 hectares to grow soybeans, wheat, corn” – an area smaller than New York’s Central Park. By contrast, a single family of “Braziguayans,” as the Brazilian settlers’ descendants are known, typically has around 5,000 hectares. “Paraguay owes a debt to its indigenous peoples. We want our land back,” said Marciano Chevogy, 37, another chief who is helping to organise a growing protest movement. He plans to lead 1,500 Ache – of the 2,500 that remain – to the capital, Asuncion, to protest for more land. In a country whose indigenous peoples often live in poverty, the Ache are admired for finding success as farmers – a remarkable transition in a very short time. Some 50 Ache families live in Puerto Barra, a scattering of wooden houses set amid the rich ochre soil and lush green of their fields. In addition to cash crops, they run small cattle ranches, fish farms and bee-keeping yards. The indigenous leaders say they are not asking much – several thousand hectares to expand. But the region’s politics, economy and culture are dominated by the Braziguayans. Local radio stations broadcast in Brazilian Portuguese. In Santa Rita, a town of 40,000 people founded by Brazilian immigrants, the main road is lined with farm equipment stores catering to Braziguayan clients. The Ache complain their demands to the government have so far fallen on deaf ears. “If the situation is not resolved, we will sue in international court,” said Jose Anegy, another community leader in Puerto Barra. 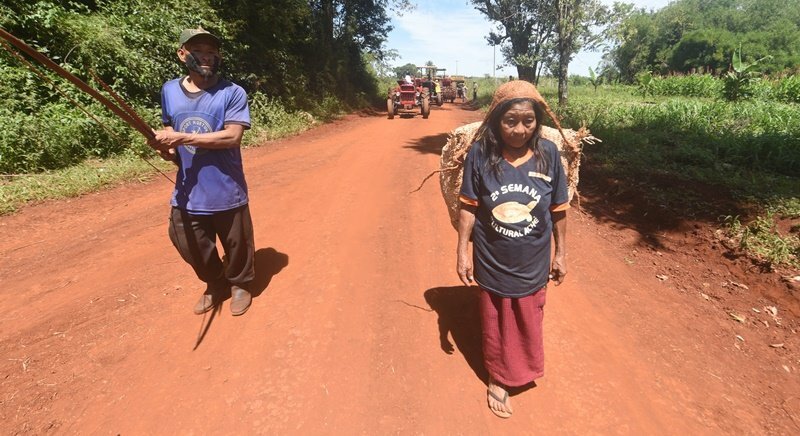 In a rural region where the state has little presence, the Paraguayan government needs to finally intervene, said Bjarne Fostervold, an American missionary who is married to an Ache woman and has adopted their cause. “The Ache only learned they were in Paraguay when they came out of the forest,” he said. Perched between modernity and tradition, many Ache are nostalgic for the past. “In the forest we were free. We lived well. Life was easier. We didn’t have to buy anything,” said Anegy. The oldest resident of the village, Lorenzo Krachogy, who is about 90, reminisced about life before the forests began disappearing. “There were lots of animals and fruits in the forest. We lived without clothes, with our bows, arrows and axes,” he said in the Ache language. “When I was nine years old, my father was killed by white men. They had dogs and rifles. They captured me and sold me,” he said. Rescued by a missionary – Fostervold’s father, Rolf – he set about finding other displaced Ache and gathering them together in the settlement that would become Puerto Barra. But life has never been the same, said Victoria Pikigy, an 80-something Ache woman, sitting on a mat of woven palm fronds. “Back then we were happy,” she recalled.